Last few weeks I was diving into a few gadgets I was missing on before. The place where I sit throughout the day has the worst possible reception spot for AT&T network – my AT&T Tilt (TyTN II) drops to GPRS in the middle of downtown Manhattan. A dozen steps towards any window improves the situation, but it’s not always possible. I asked people around, but since mostly they’re wielding iPhones with bad enough reception already, there was no way of knowing what would work. Testing with regular phones as well as Samsung Blackjack showed that the problem persists to the spot, rather than device (especially since I had flashed an updated version of radio). 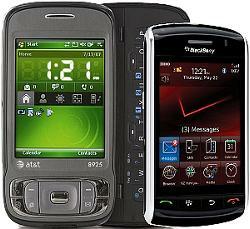 Recalling my previously very much decent experience with Verizon, I went to the closest store and bought Blackberry Storm. Now, usually I would go for Windows Mobile device, but I wanted to explore a bit into realms of other mobile OSes. I was mostly interested in Blackberry, since it has, by far, one of the biggest markets. Besides, it just look different from anything RIM had produced before. My overall impression is mostly positive. The phone is a tad smaller, significantly thinner and definitely weights a lot less than TyTN II. Storm has a 3.5mm headphones jack – something that’s been missing from a lot of HTC devices. I also liked the screen and the idea behind the different approach to touch (honestly, I love it). The cellular service was a lot better in my spot and I was almost sold to keep the phone. Although, after couple of weeks of light use I figured a few things that prevented me from staying with the phone – at least for now. First of all – the cabling. The micro-USB outlets used by Storm are not compatible with anything else. This means I have to have one more cable or charger to carry or have around (one of the reasons why I dumped Blackjack in favor of bulkier Tilt). This was the first major disappointment. Out of all the things that RIM could’ve done wrong, this was the most hurtful to the overall impression. Second – typing on the Storm’s screen is a nightmare. The advantages of the device – the thin light frame and heavy-duty screen turn against you here, because you have nothing to hold on to in order to keep your fingers off the screen in order to prevent mistyping. While it’s very convenient to click the whole screen to confirm an action, it’s just absolutely horrible to do so when trying to fast-type. Third, and that’s a bit far-fetched one, the features that were not available. As it was very well known, Verizon had stripped Wi-Fi off this Blackberry. They have also blocked the use of SIM card, which I was also interested in trying out. Since I was still within my grace period to return the device I decided not to turn all geeky on it and just let it go. Additionally, there was not as many software options as there are for Windows Mobile phones, even though that system is oh so 2005. The overall impression was mostly positive, as I have pointed earlier. It’s just the matter of habits and patterns that I have developed having been using smartphones for past 5 years that rendered Blackberry Storm not suitable for my needs. Too bad, I really liked the phone. Maybe the Storm 2, coming out closer to Fall (sources vary on exact date), will look better.